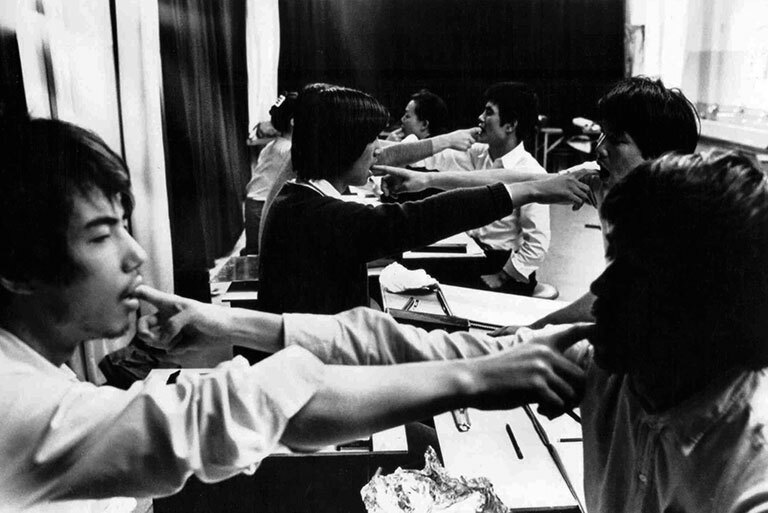 Above: Students in the class of Nakanishi Natsuyuki, Bigakkō, Tokyo, 1970, photograph Morinaga Jun. Well worth a visit to John Hansard Gallery in Southampton to see this incredible exhibition. You can read further info about Anti-Academy here. Anti-Academy examines the ideas, processes, workshops and legacies of three radical educational models in 1960s Japan, the USA and Denmark. Comprised of three installations, each relating to one of these school’s programmes, Anti-Academy explores life at Bigakkō, Tokyo (installation by Yoshiko Shimada), the Intermedia Program, School of Art and Art History, at the University of Iowa (installation by Cornelia Schmidt-Bleek), and Ex-School, Copenhagen (film by Alice Maude-Roxby and Tom Chick)……. Anti-Academy is an interpretation of how these three academies situated themselves on the peripheries of the art world, existing in opposition to the mainstream, and responding to the political and social climate, location and cultural context of the day. Below are images from the Bigakkō installation by Yoshiko Shimada. Bigakko can be seen to draw most directly from its current political context. Founded in 1969 by the publishing house Gendaishicho-sha, infamous in their commitment to publishing an eclectic selection of controversial contemporary Japanese writing, alongside French philosophy and political theories including the first Japanese publication of Marquis de Sade’s ‘Juliette’, Bigakko also exercised an extraordinary high-disciplined learning environment to accompany their progressive literature, including one teaching year where students were made to attend all classes. The school employed the most radical artists of the day and the teaching programme involved diverse approaches, ranging from vociferous political conferences to quiet meditation. 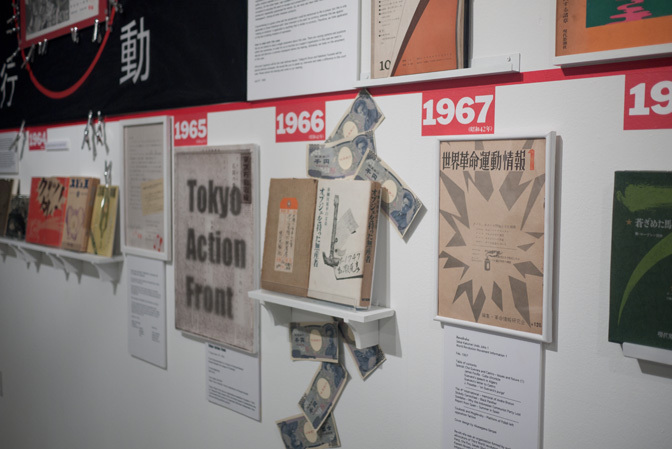 For Gendaishicho-sha, Bigakko operated in response to the social backdrop of student revolt in the post-war climate, acting as a rejection of western modernism and a questioning of Japanese cultural and political history. 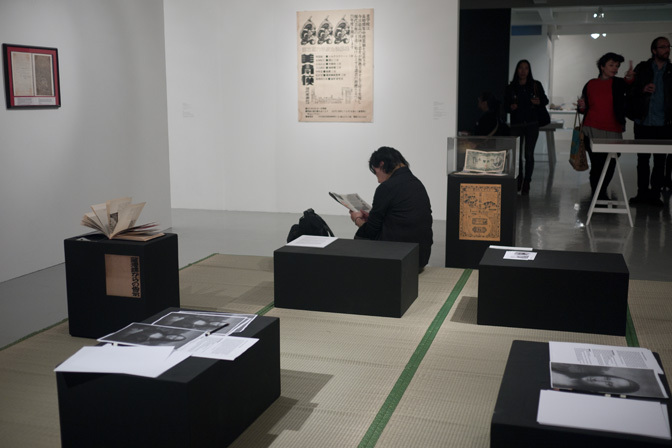 Above: Multi-positional work benches, designed by Nakamura Hiroshi and Nakanishi Natsuyuki in 1969 for Bigakkō, were intended to offer students various modes of working from kneeling on the floor to using the boxes as seats and desks. 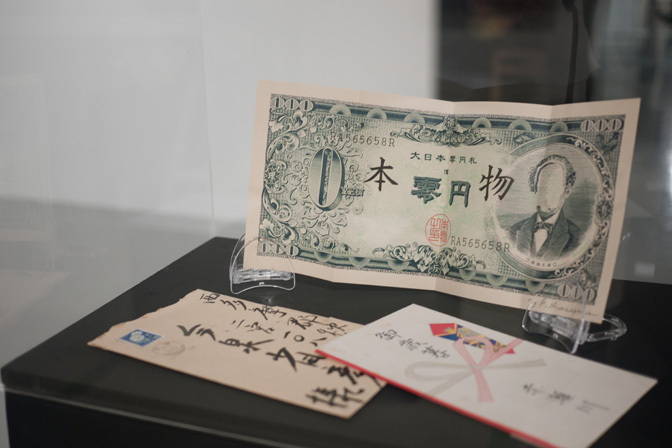 Above: Chronology Wall | Installation of artefacts relating to Bigakkō history from the archives of Imaizumi Yoshihiko and Yoshiko Shimada. A new publication accompanies the exhibition, comprehensively illustrated and with a range of essays exploring the themes and contexts of the show.